RARE OPPORTUNITY! 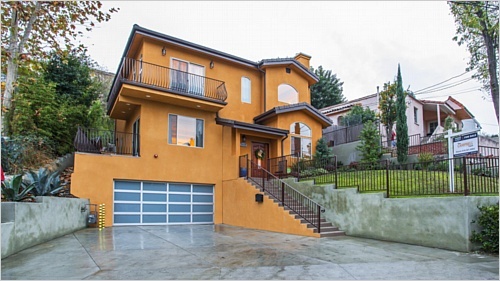 Newer construction in highly sought-after Mount Washington. This impeccable home features over 2,100 square feet of immaculately maintained, luxuriously appointed, beauty. Built in 2014, this move-in ready, contemporary Spanish home is light and bright with phenomenal views and plenty of room for entertaining while enjoying plenty of privacy on a perfect hillside. The open floorplan features warm wood floors, beautiful fireplace, gourmet kitchen with stainless appliances, custom cabinets, a huge island and granite counter tops alongside an elegant formal dining area. Sliding doors open to multiple outdoor areas including a beautiful wrap around balcony as well as a spacious rear patio which make this home perfect for entertaining. The rear patio is prime for outdoor cooking and al fresco dining, and is equipped with water line and gas line for an outdoor kitchen or fire pit. The property also features a beautifully terraced rear yard and incredible hilltop gazebo with spectacular,180 degree city views. All three bedrooms are secluded on the upper level which features a spacious master suite with treetop views, his and hers walk-in closets, large bath with separate shower and jet tub along with a beautiful balcony. The upper level has two additional bedrooms and full bath as well as laundry, and a spacious open/bonus area which is perfect for a homework station, exercise or sitting area. There is also an attached two-car garage, complete with built-in cabinets, finished floor, and pre-wired outlet for electric car charging. This is the perfect location with close proximity and easy access to downtown, Pasadena and Glendale while being located in L.A.'s highest rated, blue ribbon, school district.